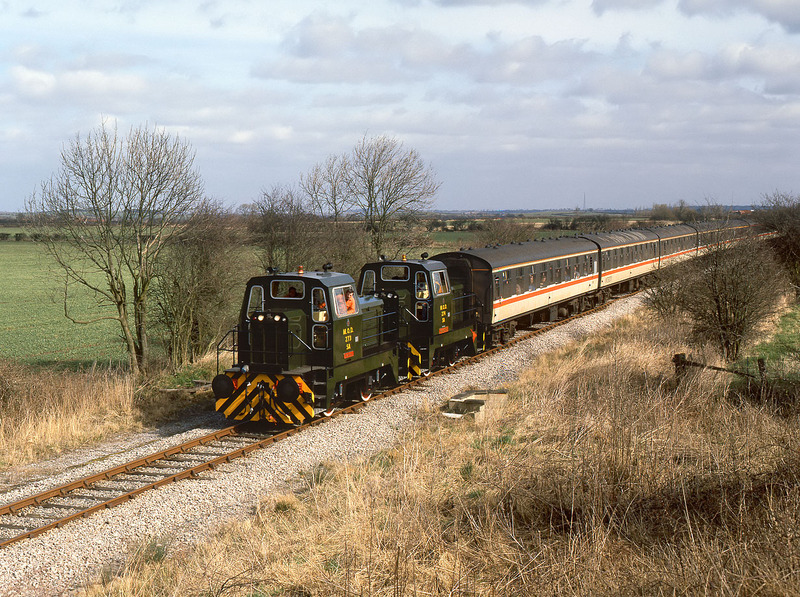 Army locos 273 Edge Hill & 274 Waggoner (built by Thomas Hill in 1987) head towards Kineton on the MoD branch from Fenny Compton exchange sidings with the Hertfordshire Railtours 1Z16 09:35 Paddington to Kineton 'Edgehill' railtour on 13 March 1994. They are pictured approximately half way along the branch, near Northend. The tour had traveled from Paddington behind 47811, and would soon be moving around the Army depot via a complicated set of reversals, which involved another Army loco (278 Coppice) on the rear.